With the front of a WRX and the rear of a sort-of Liberty/outback, the Levorg is a mash-up of Subaru’s greatest hits. Stick a nice bit of AWD, and a sweet little turbo-boxer underneath, and its winner-winner-chicken-dinner. With a platform and turbo-boxer engine of the current (soon to be replaced) WRX, and an interior space which is only a smidgen less than the old Liberty wagon, you can’t lose. Add to that, the famous AWD that made Subaru famous on the rally circuit, and the result speaks for itself. The last sports wagon was a rather cute Impreza a generation or two ago. Since then, there has been a gaping chasm in Subaru yum-ability. OOO that reminds me, ask Subaru why this 197kw boxer can’t be shoehorned into a delicious factory-go-quick BRZ! Now, you must not confuse a sportswagon with a sports car. A sportswagon has oodles of space for wet suits, flippers, golf clubs, and climbing ropes, and isn’t too precious about being abused. A sports car usually has enough room for a couple and their overnight bags, and is fairly precious about potholes and gracvel. 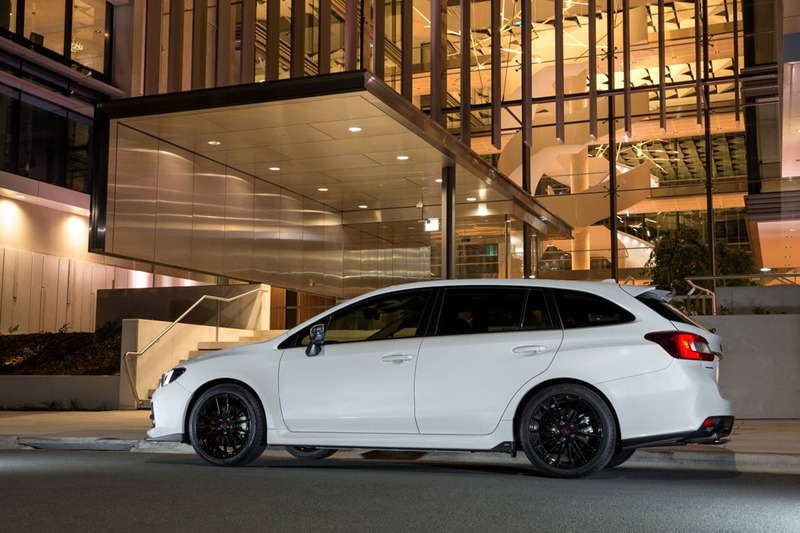 If you think of Levorg as a slightly larger WRX wagon, you can’t go wrong. The 2.0 Boxer engine is turbo charged, has direct injection and is mated to a CVT transmission. A CVT is that funny sounding thing that makes your engine sound like its doing 160KPH, but is actually just past walking pace. It has no gears and uses a couple of ice cream cones and a rubber band that slide in and out, or something like that. 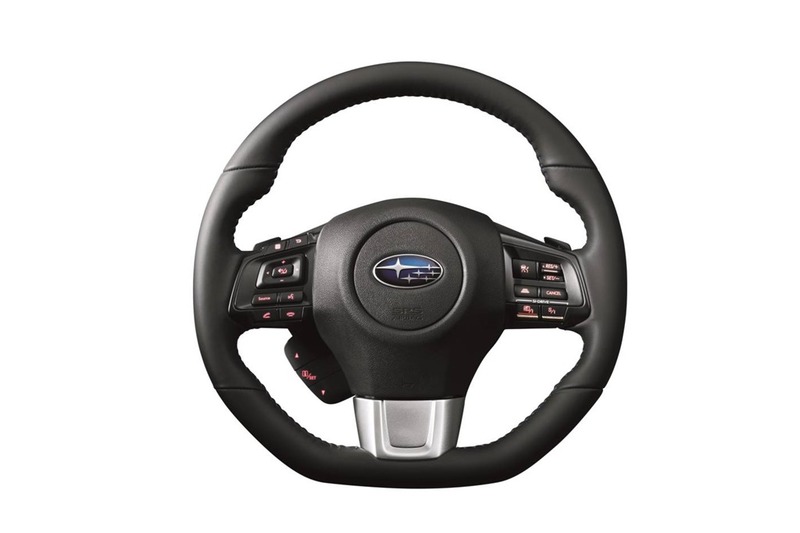 Under normal acceleration, the Subaru CVT allows the speed to build up while the revs stay constant. However, if you shove your foot to the floor, the CVT then behaves more like a normal auto 6 speed transmission. Selecting the SI buttons on the steering wheel, moves the mode from Intelligent (I) mode to Sport (S) or Sport Sharp (S#). The CVT then uses 8 steps instead of 6. The shift is smooth and fast, and as CVTs go, this is a good one, but I will always lament a proper clutch. The engine is as sweet as a nut with smooth yet gentle power delivery. The turbo is quick to spool up with the 197kw/350Nm coming online early. It gives take-offs a briskness you’d expect from a much bigger power plant. In a way, the turbo “whoosh” of the past is sadly missed. Although the familiar “chuffing” sound from WRXs is absent, there is a pleasing growl punctuated by the occasional high pitched whine if you have the windows down. The grand unveiling took place in mid-north NSW. We drove from the coast at Port Macquarie, along the Oxley Highway, to finish at Tamworth Airport. We had a bit of everything thrown in including a stop for a late morning tea at a local country pile called Langford. There were majestic mountain vistas, deep verdant valleys, long sweeping curves, tight bends and the odd switchback. The road surfaces varied hugely too. Urban Australia is bad enough, but venture more than a stone’s throw from the goat tracks masquerading as highways, and the condition deteriorates substantially. The situation was further tempered by particularly moody weather. First there was light rain, then wind and a blast of sun, then sudden cold where things would come over all sulky again. Once on the move, the Levorg felt very familiar. The wagon train pulled out of Port Mac and quickly spread out across the countryside. My co-driver and I are not known for winning speed runs. Even on a launch, it is the experience of the trip, not the arrival time that matters. You take the time to crack a window and breathe in the invigorating country air and all of a sudden it all feels fresh and new. The Levorg made a decent fist of the mini road-trip. Things looked good. 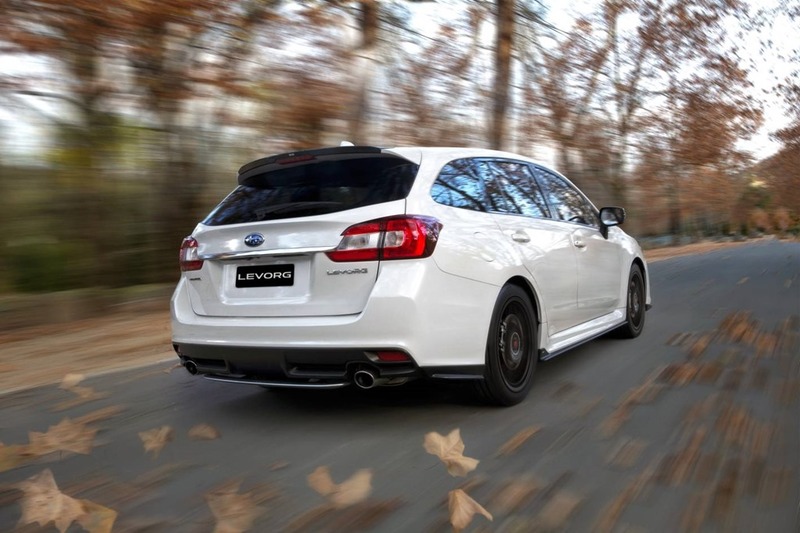 It is a rare car that does nothing wrong, and the Levorg is one such car. 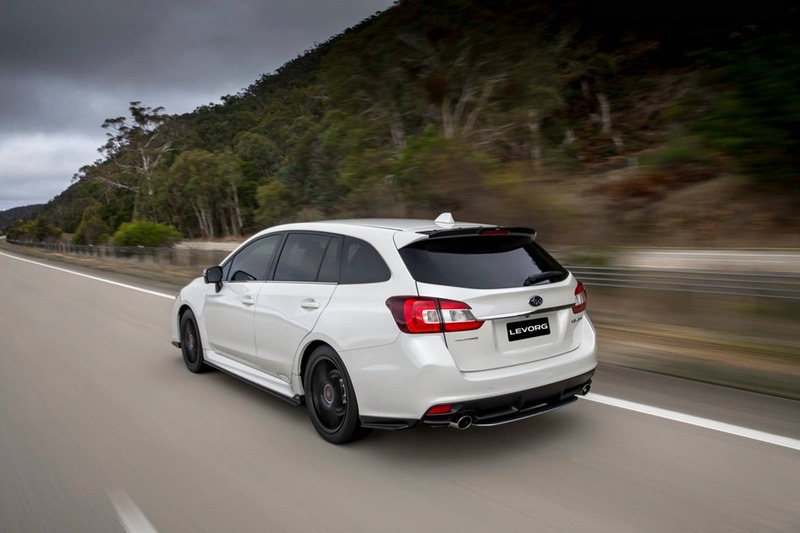 There are 3 models with a GT, GTS and GTS with a 4 grand STi trim upgrade. 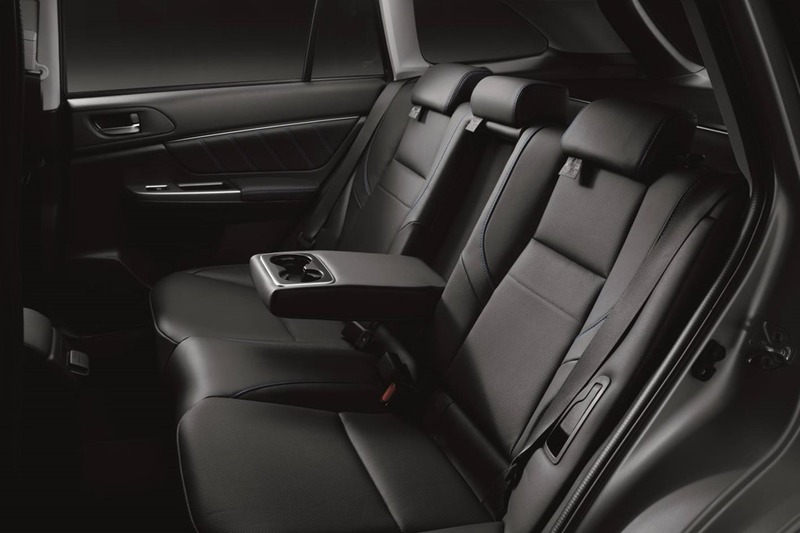 The GT has comfy fabric seats that are soft and cosy. There is no hint of the deeply carved, hard-as-nails seating you normally get in cars with bonnet scoops. The GTS has leather, which I can take or leave when it is only on the seats, but that’s another story. The GTS also gets Bilstein suspension which takes away some of the comfort we enjoyed in the GT. Considering how nicely rounded the GT felt, I found the upgraded shockers unnecessary. They would have been better as an option so the soft ride could be enjoyed in both models. The GTS also gets same safety gear, and a SIRI-compatible voice system. 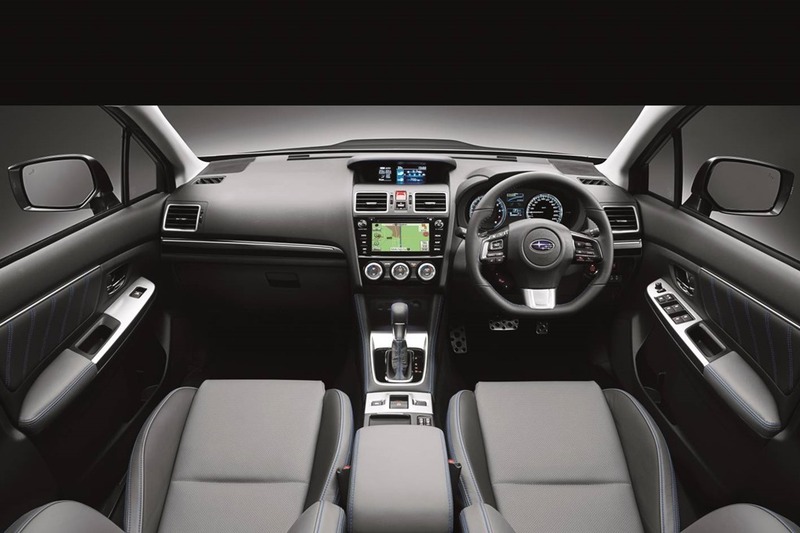 There is no Apple Carplay/Android Auto but Subaru says “watch this space”, so watch this space. The infotainment systems are different which is slightly annoying. I’d have hoped for Satnav as standard in all models for this price. The GTS gets the 7” LCD, with the GT making do with a 6.2” screen sans Satrnav. Tsk tsk! The well designed cabin is comfy with decent quality in the plastics, and everything within easy reach. 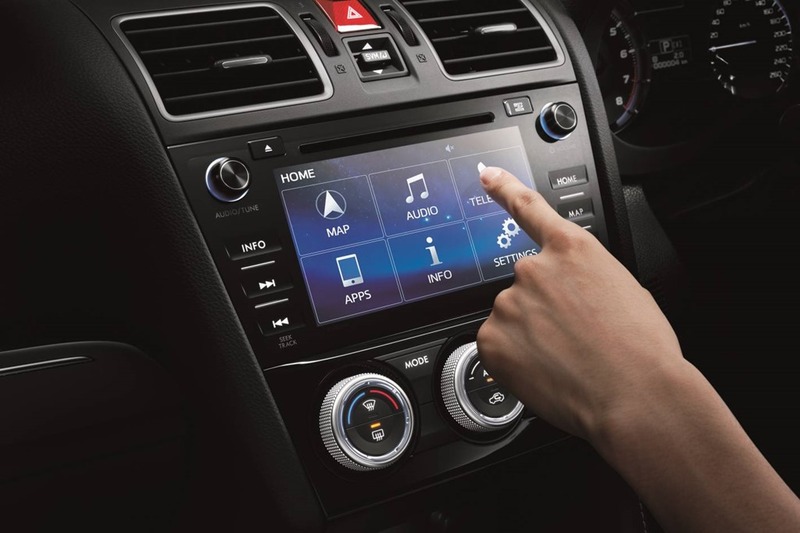 The infotainment systems respond fairly quickly and the sound is decent even in the “base” model. I say “base” because it costs $42,990. I encourage Subaru’s product manager to work on Satnav if he can’t manage Carplay for that price. The stiffened chassis, rigid frame and use of aluminium in the bonnet and grille make the drive frisky, yet quiet. 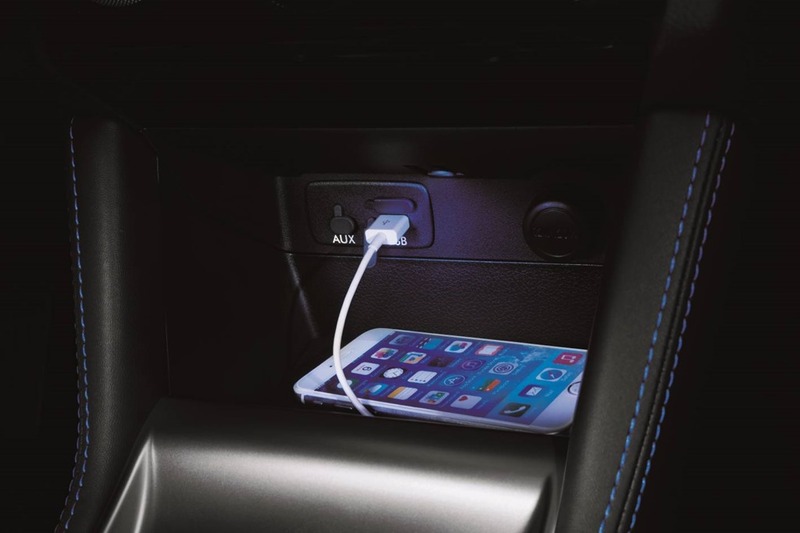 It also makes Levorg lighter and therefore quicker. The quietness inside is thanks to extra sealer, with a thickened toe-board and floor pan to decrease the NVH (noise, vibration, harshness) further. As a result, there is a noticeable hush unless you really push hard. The engine lowers the centre of gravity and is one of the reasons all Subarus have horizontally-opposed/flat-four/boxer engines. You notice the low centre of gravity as the corners get unexpectedly tighter. The symmetrical AWD keeps the wheels going where you want them to and are particularly useful on greasy or gravel covered roads. The power goes to all wheels, so you got less chance of just one wheel with grip. You’ll also notice very little understeer. There is nothing more un-nerving than turning the steering wheel but the car still wanting to travel straight ahead. Some of the corners were tight but never over taxing. If there was one fault, it was that the GT had plenty of seat padding, but less sideways support in spirited cornering. Sports seats have big side bolsters to keep your bum and back centred, and while I said this is not a sports car, it begs to be thrashed. I liked everything about the Levorg but the price. Mind you, I say most cars cost too much. It feels like a WRX with the sharp edges knocked off, and I like that. A sharp hard car is very wearing on the nerves after a while. 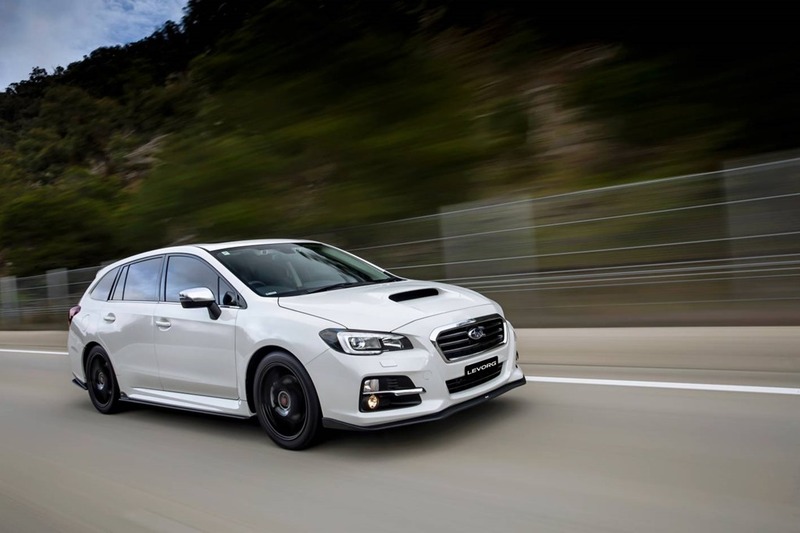 A Levorg is a well-built mix of design and utility with just a hint of premium quality finish thrown in. I like the way it drives. I like the way it looks. I like the way it feels to be inside of. Only Apple Carplay and a manual gearbox could make it better, that is if you don’t include a price reduction. Perhaps we just “want, want, want”, but that’s what a buyer feels when he or she walks into a show room. I wish Levorg well. 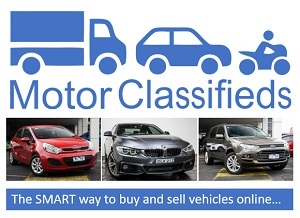 It certainly deserves to be on shopper’s lists. Would I buy one? Yes but I’d always long for a manual.